After serving the regional public transport industry for over 50 years Akamba Bus Company has wound up operations due to financial constraints. 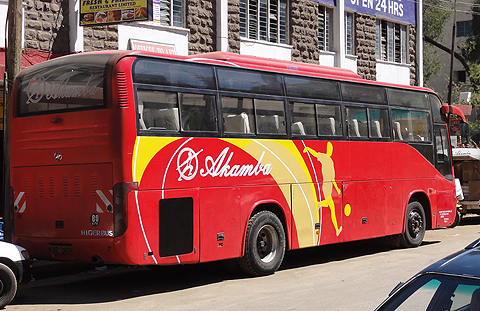 Sources from Kenya revealed that Akamba was highly indebted to several financial institutions and other service providers, who confiscated its buses. However, a source from the Transport Licensing Board, the watchdog for the transport industry, said the firm’s management had not yet officially informed them about their withdrawal from the business. “We are yet to communicate to our counterparts in Kenya, the Kenya Transport Licensing Board, as there is no contact office in Uganda,’ said the source. The firm ceased operations about a month ago. Efforts to reach the firm’s Kampala manager, Japhet Kimilu, were fruitless as his phone was not available by the time we went to press. The premises formerly occupied by Akamba are being rebranded for Easy Coach, which is, plying the Kampala-Nairobi route. Akamba is not alone. Already local public transport operators have silently forfeited their buses to money lenders after failing to pay back loans. “Many operators have lost their buses to banks through public auction after failing to pay back the loans due to increased operational costs,” said one bus owner.